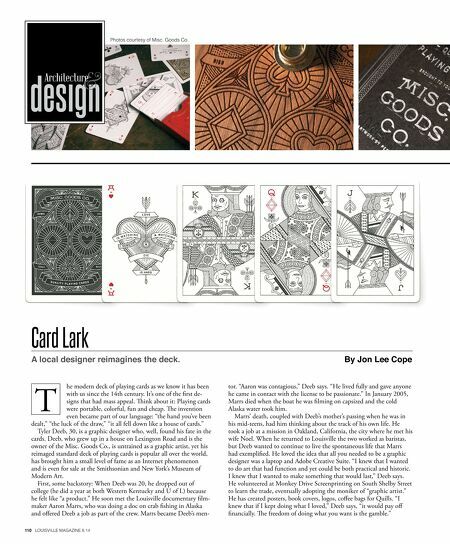 110 LOUISVILLE MAGAZINE 8.14 design Architecture he modern deck of playing cards as we know it has been with us since the 14th century. It's one of the frst de- signs that had mass appeal. Tink about it: Playing cards were portable, colorful, fun and cheap. Te invention even became part of our language: "the hand you've been dealt," "the luck of the draw," "it all fell down like a house of cards." 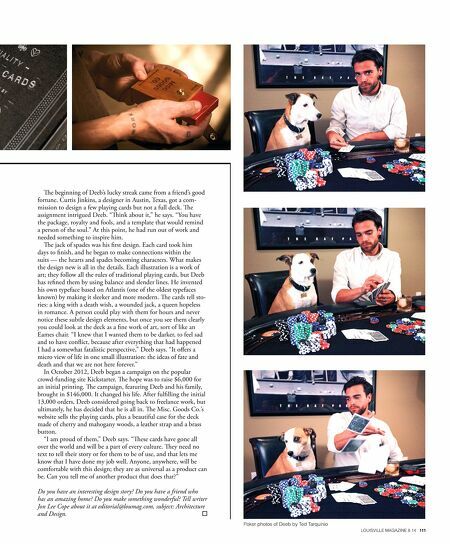 Tyler Deeb, 30, is a graphic designer who, well, found his fate in the cards. Deeb, who grew up in a house on Lexington Road and is the owner of the Misc. Goods Co., is untrained as a graphic artist, yet his reimaged standard deck of playing cards is popular all over the world, has brought him a small level of fame as an Internet phenomenon and is even for sale at the Smithsonian and New York's Museum of Modern Art. First, some backstory: When Deeb was 20, he dropped out of college (he did a year at both Western Kentucky and U of L) because he felt like "a product." He soon met the Louisville documentary flm- maker Aaron Marrs, who was doing a doc on crab fshing in Alaska and ofered Deeb a job as part of the crew. Marrs became Deeb's men- Card Lark A local designer reimagines the deck. By Jon Lee Cope tor. "Aaron was contagious," Deeb says. "He lived fully and gave anyone he came in contact with the license to be passionate." In January 2005, Marrs died when the boat he was flming on capsized and the cold Alaska water took him. Marrs' death, coupled with Deeb's mother's passing when he was in his mid-teens, had him thinking about the track of his own life. He took a job at a mission in Oakland, California, the city where he met his wife Noel. When he returned to Louisville the two worked as baristas, but Deeb wanted to continue to live the spontaneous life that Marrs had exemplifed. He loved the idea that all you needed to be a graphic designer was a laptop and Adobe Creative Suite. "I knew that I wanted to do art that had function and yet could be both practical and historic. I knew that I wanted to make something that would last," Deeb says. He volunteered at Monkey Drive Screenprinting on South Shelby Street to learn the trade, eventually adopting the moniker of "graphic artist." He has created posters, book covers, logos, cofee bags for Quills. "I knew that if I kept doing what I loved," Deeb says, "it would pay of fnancially. Te freedom of doing what you want is the gamble." T Photos courtesy of Misc. Goods Co.